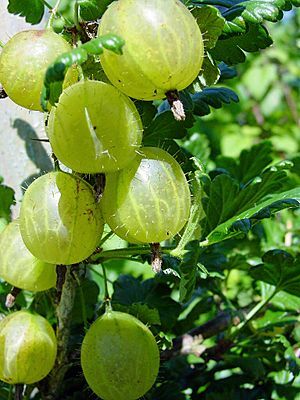 The gooseberry is a type of fruit. It has a greenish color. It looks like an ungrown clementine. It belongs to the same family as the currant. In a 100 gram serving, gooseberries provide 44 Calories and are an excellent source of vitamin C (33% of the Daily Value) (table). No other nutrients are in significant content (table). Gooseberries are 88% water, 10% carbohydrates, and less than 1% each of protein and fat (table). Gooseberry Facts for Kids. Kiddle Encyclopedia.